This lens hood is specifically design for Canon EF-S 10-18mm f/4.5-5.6 IS STM Lens only (Not compatible with other lens model). Please Check your lens model before purchase. 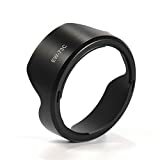 Lens hoods are primarily designed to prevent unwanted stray light from entering the lens by extending and shading the end of the lens , shelter the interference of the lateral light source to improve your contrast and image quality. Designed with camera mount and with no dark corners; reversible.Light and portable, easy to install and carry. It can prevent accidental damage to the lens, also avoid accidental finger touch to the lens surface; to some extent to prevent sand, rain and snow for lens as well. 1. Designed with camera mount and with no dark corners; reversible; can shelter the interference of the lateral light source. 2. Portable; the UV lens and lens cover can be installed when the hood installation is finished. 7. Main functions: inhibiting halo; avoiding stray light; preventing dust, avoiding lens collision and protecting the lens. This entry was posted in Discount Photography and tagged 1018mm, Canon, EW73C, f/4.55.6, Hood, lens by Ball Photo. Bookmark the permalink.